LONDON - Milan 11 March 2009->11 March 2011, 2 years ago the beginning of Pretty Green. More about Pretty Green and financial issues. As Liam on his (only one) tattoo: "TCB take care of business" (from Elvis Presley). Photo: one of the new t-shirts, with a vinyl record printed. Now there are also nice Harrington jackets, we were waiting for them (worn by Elvis, McQueen, etc., see that post) and John Lennon military jackets. The last celebrity appointment to the board of a quoted fashion group was hardly a runaway success: the Australian model Elle Macpherson stepped down as a director of the surfwear label Hot Tuna in 2007 after barely 18 months. I now hear that, undeterred, another well-known show-business face might one day appear before City investors. 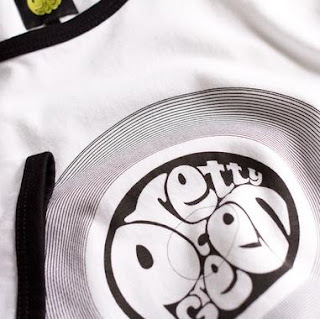 Pretty Green, the clothing label founded by the musician Liam Gallagher, has recently begun sounding out small-cap brokers about the idea of a stock market listing, although a flotation remains some way off. Appointing the combustible Mr Gallagher to the board of a public company would certainly guarantee a turnout at Pretty Green annual meetings. Investors wanting to keep on the right side of him would be well-advised, however, not to confuse the label with another well-known UK clothing brand: Oasis.